Originally from Chicago, Elizabeth Saven studied graphic design at The University of Denver, a focus that began largely on a whim. Much to her own surprise, she quickly went from being totally inexperienced to winning Best of Show in the student art exhibit the following year. After graduating, Elizabeth was catapulted into the design world of television, landing her first full time job with CBS News in Chicago. After 2 successful years, the news magazine show EXTRA brought her to Los Angeles as the Assistant Art Director. Soon after, she was promoted to Art Director, where she was responsible for the total reinvention of look and feel of the show. 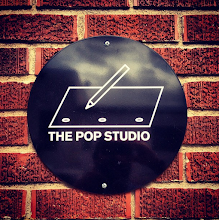 In 1998, Elizabeth took a creative leap and was hired at the progressive broadcast design company Fuel in Santa Monica. There she worked as an Art Director on many high profile design projects, including work for NBC, MTV, Bravo, Coca Cola, Burger King, The Slamdance Film Festival, and a number of other celebrated ad campaigns. After seven years in the TV industry, Elizabeth wanted a change, which led her to launch her own independent design business, for which she created corporate identities as well as package design. In 2002 Elizabeth married, and two years later she and her husband, Jonathan had their first son, Asher, who was soon followed by their second son, Liam, in 2005. While mothering small children, Elizabeth was often struck by how difficult it was to find the kind of art she would have wanted for her sons’ bedrooms, so she began creating modern baby prints; these quickly caught the attention of many parents she knew, and thus Fancy—a business that sells modern printed pieces to design-savvy moms and dads—was born. In a flash of inspiration, Elizabeth one day decided to turn off the computer and pick up the paintbrush because she needed a change from the confines of technology-based design—perhaps an inevitable transition considering that she comes from a maternal lineage of painters. Starting with owls because of how drawn she is to their simple form and natural beauty, Elizabeth utilizes years of experience with composition, contrast, color and shape to bring the paintings to life with her own quirky and whimsical angle. 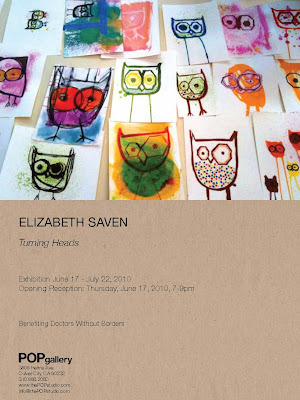 “Turning Heads” is Elizabeth’s first one-woman show. She continues to paint with inspiration, curiosity and wide eyes.